"The Boulevard" is a promenade that runs parallel to Baku's seafront. This area - popular for strolling and taking in views of the Caspian - was recently named a national park. Its history goes back more than 100 years, to a time when oil barons built their mansions along the Caspian shore and when the seafront was artificially built up inch by inch. 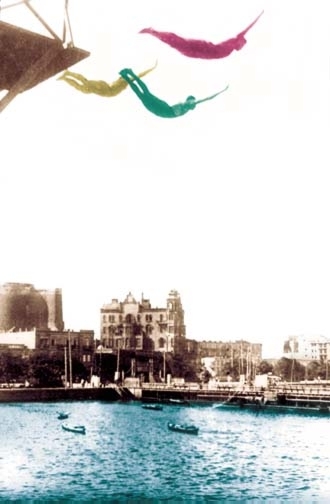 Left: Divers performing at the Baku Bathing House, early 20th century. As of 1806, the Maiden's Tower was only 5 to 10 meters away from the Caspian Sea. However, as the Caspian receded, the land along its shore was reclaimed. 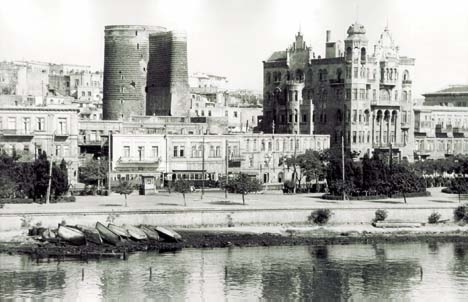 In 1884, the double fortress walls along the sea surrounding Ichari Shahar (Inner City) were demolished and construction began on one of Baku's first major avenues, the Alexandrovskaya Naberezhnaya (Alexandrian Quay), which is now known as Neftchilar Avenue (Oilmen's Avenue). The avenue was designed to connect the oilfields in Bibi Heybat (south of Baku) to the oil refineries in Black Town (to the northwest). Until the early 20th century, the avenue had mansions on one side and seafront on the other. There were no trees. Tons and tons of fertile soil were imported to enrichen the soil quality. 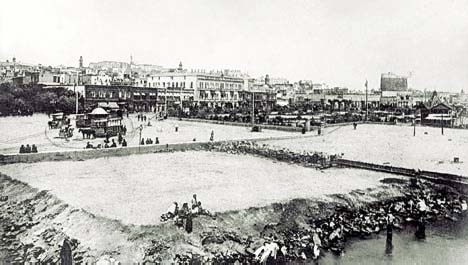 Baku's Mayor, R. R. Hoven, supported by the richest industrialists, passed a decree in the 1880s saying that all ships entering Baku harbors from Iran had to bring fertile soil with them. In reality, this was a kind of "tax" or "duty" imposed for the right to use the harbor and load up with oil. 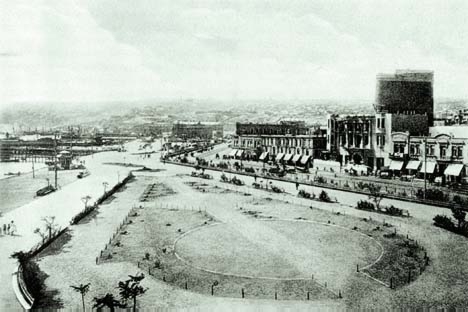 Within a very short time, enough soil was deposited, and the parks that characterize the city's seafront today were developed. Photo: The sea front before the Boulevard Park was built up. Maiden's Tower is in background. In 1900, the Municipal Horticultural Commission decided to plant trees and shrubs along the seafront. Kazimir Skurevich, a Polish engineer, designed a 20-meter-wide embankment, using vegetation that would survive Baku's extremely hot, dry and gusty climate. The project was placed on reclaimed land near the Mir Babayev residence (now the SOCAR building). Photo: Plan for the Boulevard Park, pre-Soviet period. The next campaign to improve the Boulevard was launched in 1910 by Mammad Hassan Hajinski, Head of Baku's Municipal Construction Department. At his urging, the Duma (Municipal Parliament) passed a resolution to allocate 60,000 rubles to improve the promenade. Adolph Eykler, a German architect who had also designed Baku's German Lutheran Church (kirke), was involved in the project. 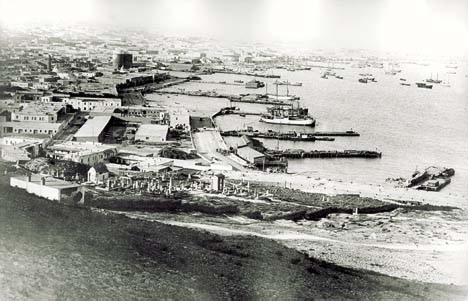 Photo: Building up the seafront which is now the SOCAR circle. To select the best design for the Boulevard, Hajinski organized a contest among the architects in Baku. However, since most of the city's 30 architects were busy designing mansions for oil barons, only three submitted plans for it. The winning design was titled "Zvezda" (Star) and featured a bathing house, luxurious restaurant and a dozen pavilions. The design specified that wastewater would be collected in a separate manifold instead of being discharged directly into the Caspian (which unfortunately is the case today). Work was completed in 1911. Photo: Building up the quay. Ships coming to Baku to purchase oil were obliged to exchange shiploads of soil to help build up the sea front. At the new Baku Bathing House, visitors could take a swim while visiting the Boulevard. Unfortunately, this bathing house was closed in the late 1950s due to poor maintenance and the bay's polluted water. Photo: Maiden's Tower and the Hajinski residence (built in 1912). The improved Boulevard stretched from what is now the SOCAR Circle to the luxurious cinema, restaurant and the casino that was called "Phenomenon", designed by Polish architect Joseph K. Ploshko (1912). During the Soviet period, the casino was converted to a Children's Puppet Theater, a function it still serves today. Subsequently, the Boulevard was extended up to the Port Arrival Station. In the 1980s, the region was more or less mismanaged and, as is true with most public spaces, maintenance was neglected. The situation further disintegrated as the level of the sea began to rise so high that many of the trees and shrubs in the park started dying off due to the salinity of the water. Now, once again, the Caspian sea level is going back down. The fact that the Boulevard has finally been given the status of a National Park brings hope that gradually the Boulevard will become the vibrant park that it was originally intended to be more than a century ago. Fuad Akhundov, history enthusiast who wrote this article, specializes in the architecture of early 20th-century Baku. Deep appreciation is also extended to Shamil Fatullayev, Director of the Institute of Arts & Architecture at the Academy of Sciences. Photos are courtesy of the National Archives of Photo and Cinema Documents.